It's been an eventful few years for UB40. Singer Ali Campbell quit in 2008 blaming management and business problems - which appear to have been real problems since just three years later they were declared bankrupt. Ali's brother Duncan was drafted in to replace him and in 2010 the band recorded 'Labour of love IV'. Now the band are releasing a new album - 'Getting over the storm', the first since the bankruptcy and the first album to contain new material since 2008's TwentyFourSeven (Labour of love IV being an album of covers). 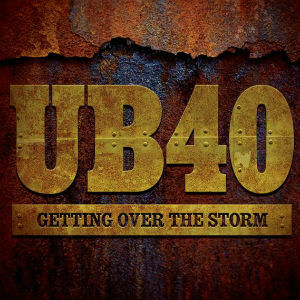 As with many of the band's albums, this new release contains a mix of new original songs, and cover versions, with just five of the thirteen songs being UB40 originals. Personally that straight away struck me as disappointing - a handful of covers is one thing, but when your last release was a covers album, to pack so many covers into this album seems excessive. Many of the covers on this album were originally written or recorded by Country music stars, which at first sounds like an odd choice until you realise that Country is very popular in the Caribbean alongside Reggae. When you listen to the album, the country music influence is really clear. Yes it's a reggae album, but there's considerable use of the Pedal steel guitar, which more than any other instrument really does give a strong Country feel to the music. It works surprisingly well - Reggae with a country music feel, but listening to the album I do think there's too much pedal steel guitar - it does start to take over a bit. The overall sound though is classic UB40. I've got mixed feelings about this album - it's a good album, but it's just not one that's likely to be regarded as one of their best. I think for me the excessive reliance on covers and the corresponding use of the Pedal steel guitar spoils it slightly. I still enjoy the album enough that I've pre-ordered it, but as I've already said, I don't think it's their best work.